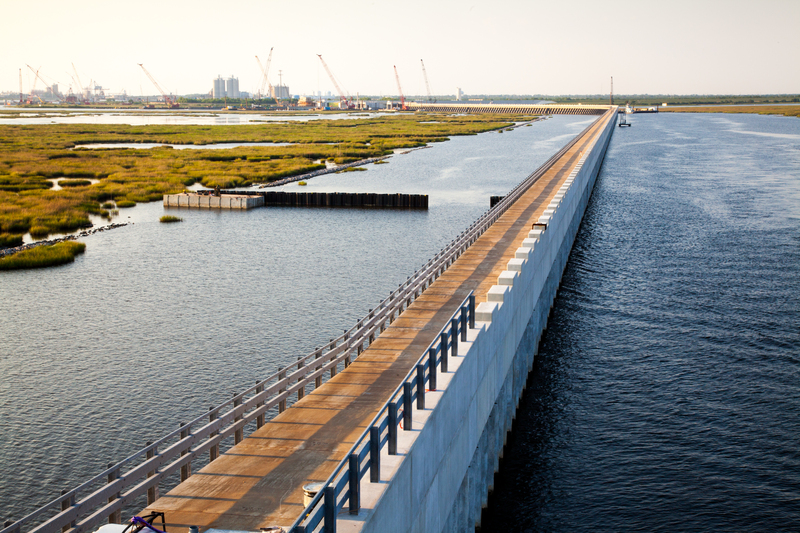 Following Hurricane Katrina, APTIM was hired to design and construct a first-of-its-kind 10,000-foot-long, 26-foot-high surge barrier to provide 100-year-level flood control protection for the greater New Orleans area prior to the 2011 hurricane season. APTIM collaborated closely with USACE, at times working two 10-hour shifts per day to meet the client’s aggressive schedule. We also self-performed fabrication of the surge barrier’s large components (steel piles/bulkheads/gate structures) at our AISC-certified Delcambre, Louisiana, fabrication facility, which reduced costs, accelerated the schedule, and ensured the client’s stringent quality requirements were met. Understanding the complexity of the massive project, APTIM and USACE established a collocated government and private team to maintain a single vision of success regarding priorities, issues and required deliverables. This proactive management approach facilitated real-time dialogue between the APTIM and USACE engineering team, led to stringent document control, and allowed for daily problem-solving and on-the-spot issue resolution meetings—which were critical to maintaining schedule, cost, quality and safety. APTIM’s approach to managing the project resulted in quality work, a superb safety record, and the on-time delivery of a surge barrier that protects the people of New Orleans from the effects of a storm surge event that has a one percent chance of occurring in any given year, also known as 100-year-level risk reduction. On August 28, 2012, nearly seven years to the day that Hurricane Katrina devastated the city of New Orleans, the newly constructed IHNC Surge Barrier faced down Hurricane Isaac’s storm surge—estimated to have been as high as 14 feet—verifying the quality of APTIM’s work and helping to restore faith to the city of New Orleans. To date, the IHNC Surge Barrier project has won more than 10 industry awards, including The American Society of Civil Engineer’s 2014 Outstanding Civil Engineering Achievement Award.